The process of using various instruments for crushing a urinary calculus. An organism whose carbon needs are satisfied by carbon dioxide. 1. An etched stone surface for printing, having the design in relief; also, the process of printing from such a surface, or that which is printed from it. 2. A machine, with a keyboard like that of a typewriter, for making a lithographic transfer sheet. It produces a perforated strip of paper which controls the printing. 3. To prepare for printing with plates made by the process of lithotypy. 4. In geology, a visually observable band in humic coal that is analyzed on the basis of its physical characteristics rather than its botanical origin. 1. The art or process of making a kind of hard, stereotype plate, by pressing into a mold, taken from a page of type or other matter, a composition of gum shellac and sand of a fine quality, together with a little tar and linseed oil, all in a heated state. 2. A printing process in which types are impressed in a soft matrix, the resulting hollow spaces being filled with a heated mixture that later solidifies and can be used for printing. 1. A reference to a calculus, or stone. 2. Having the properties of a calculus. 1. Excess urinary excretion of uric acid. 2. The passage, usually painless, of tiny calculi (gravel) during urination. Calculi formation in the ureter. 1. The layer of loose rock resting on bedrock, constituting the surface of most land. 2. The layer of disintegrated and decomposed rock fragments; including soil, just above the solid rock of the earth's crust. A structure or arrangement of large stone slabs; especially, those found in northern and western Europe from the Mesolithic period: Stonehenge in Southern England is one example of megaliths. © ALL rights are reserved. 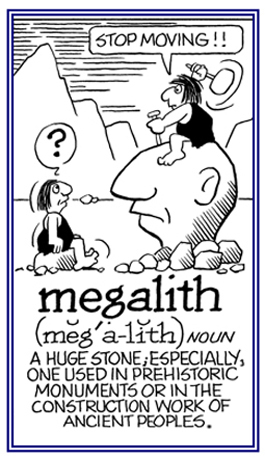 In archaeology, referring to, or relating to, megaliths or large stone structures sometimes forming part of a groiup or a circle; such as, megalithic tombs or monuments, megalithic architectures; which are thought to have been important to people in the distant past for social or religious reasons. The Middle Stone Age, an archaeological period about 10,000 to 4,000 years B.C. Organisms that live in rock cavities. The formation, presence, or discharge of minute concretions, or gravel. Showing page 13 out of 18 pages of 257 main-word entries or main-word-entry groups.